The AME BARI ProTec 6742plusS and AME ProTec 6748plusS is designed to be used in the prevention, treatment and management of pressure ulcers. Mattress operates in an alternating pressure mode. Ideal for use in nursing homes, hospitals and home use. Raised perimeter surrounds the length of the mattress preventing the patient from becoming trapped between the mattress and side rails. Available in 42” width (AME Bari ProTec 6742+S) & 48” width (AME Bari ProTec 6748+S) . Alternating pressure control unit cycles air every 5-10 minutes between A/B Cells. Low air loss circulates air for moisture management. 20 nylon-coated, 8” deep air cells provide full immersion and envelope the patient. 2” foam base with waterproof barrier adds safety and comfort and prevents contamination. Quiet, energy efficient, reliable and lightweight control unit. Push button comfort adjustment accommodates multiple pressure settings. Continuous pressure monitoring and low pressure/normal pressure indicator lights. Auto firm mode for ease of transfers. Low friction and shear nylon top cover; waterproof & breathable. Integrated raised side air bolsters with egress openings prevent patient falls. 1. Place mattress flatly on the bed frame. The inflation tube should be towards the foot end. See (sample) figure on right. 2. Cover with a cotton sheet to avoid direct skin contact & reduce friction (not included). Connect the inflation tubes from the mattress to the controller's inflation ports. Make sure they are properly attached and not leaking. NOTE: Make sure the air hoses are not kinked or tucked under the mattress. Also check to ensure the CPR valve is properly attached. 5. Plug the power cord into an electrical outlet with grounded AC power. This product should be grounded. The power cord has a grounding wire with a grounding pin. The three wire plug must be plugged properly into an outlet and grounded as shown in the Grounding Instructions section. 􀀃 NOTE: Before inserting the plug into the outlet, make sure the voltage is compatible. Also make sure this product is well grounded. 7. Make sure to disconnect the control unit by unplugging the power cord when it is not in use. DO NOT use another pump with different specifications. It is dangerous to use a pump with a pressure capacity greater than 120mmHg. This may result in air cell failures. DO NOT change any component by yourself. If there is a need for replacement or repair, please contact American Medical Equipment. When the Normal Pressure LED (green) comes on to indicate the pressure is adjusted to a desired firmness, the patient can then lie on the mattress. Please cover the mattress with a cotton sheet to avoid direct skin contact and for the patients comfort (not included). A firm surface will make it easier for the patient to transfer or reposition. Make use of the static mode function. 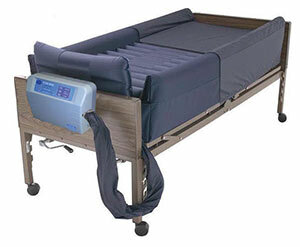 It can support the patient by keeping the mattress from bottoming out when the patient is in a sitting position. See figure right. Check to see if a suitable pressure is selected by sliding on hand between the air mattress and foam base (or bed frame if there is no foam base) to feel the patient's buttock. Users should be able to feel the space in between, and the acceptable range is approximately 25 to 40 mm (1" to 1.5"). This hand check procedure is issued by AHCPR. Step 1 - Turn on the power. The power and Low Pressure LED will come on. The control unit starts to pump air into the mattress. The alarm will beep and it's LED will come on to alert that pressure is low. Press the Alarm Reset button to mute the alarm, and it's LED will continue to flash. Step 2 - When the pressure reaches the preset level by factory default, the normal pressure LED will come on, and the Low Pressure LED (and the alarm) will turn off. If the Low Pressure LED (and the alarm) doesn't go off, please contact American Medical Equipment for equipment examination. Note: During normal operation, there may be a leakage when the Low Pressure LED comes on or the alarm sounds. Please refer to the troubleshooting section. Step 3 - Turn the pressure-selector knob to adjust the pressure from the soft to firm position. (approximate pressure range is 20 to 50 mmHg) Note: For suitable pressure, please refer to the previously described hand check procedure. Step 4 - The unit is preset in alternating mode and it's cycle time is set at 10 min / 60Hz or 12min / 50Hz Press the static button to set it in static mode, and the Static LED will come on. The pump will enter static mode after it completes the last alternating cycle time. Press the static button again to restart the alternating function. Note: Press the static mode button from the touch panel to provide a firm surface that makes it easier for the patient to transfer or reposition. The static mode can support the patient by keeping the mattress from bottoming out when the patient is in the sitting position. Step 1 - Turn on the power. A beep sound will begin the operation. Step 2 - These two types will enter a static mode initially when the power is turned on. First it will inflate the mattress to approximately 30mmHg and then enter the alternating mode. 􀀃 If 30 mmHg cannot be reached within 30 minutes, the unit will stay in static mode and keep inflating. If 30mmHg still cannot be reached within another 15 minutes, the alarm will beep and it's LED will come on. 􀀃 Press the Alarm Reset button to mute the alarm. The Alarm LED will flash. Press the Alarm Reset button again to have the audible alarm and Alarm LED on again. Step 3 - The alternating cycle time and the pressure level are present to the middle settings. Select from the touch panel to adjust the cycle time and pressure level. 􀀃 Press the static button to set it in static mode, and the static LED will come on. The pump will enter static mode after it completes the last alternating cycle time. Press the Static Button again to restart the alternating function. 􀀃 Note: Press the static mode button from the touch panel to provide a firm surface that makes it easier for the patient to transfer or reposition. 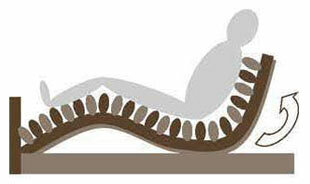 The static mode can support the patient by keeping the mattress from bottoming out when the patient is in the sitting position. Step 4 - During normal operation, the unit will monitor pressure. If the pressure is lower than a set pressure, the controller will automatically inflate the mattress to the set pressure level and then stop. The alarm will beep and it's LED will come on to alert a low pressure condition. 􀀃 Press the Alarm Reset button to mute the alarm. The Alarm LED will flash. Press the Alarm Reset button again to have the audible alarm and Alarm LED on again. 10 -70 mmHg for Model 6700 MAX.